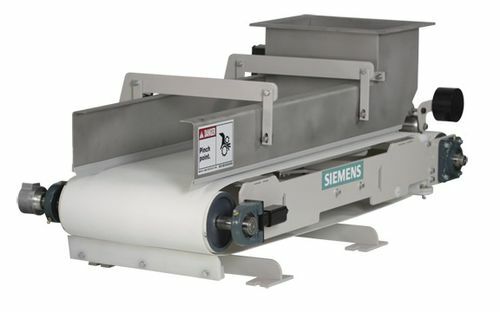 Developed by Siemens, Milltronics weighfeeders are designed to improve the accuracy of blend consistencies, processing, record keeping and accountability. This lineup of weighfeeders ship with a speed sensor and a belt weight bridge, but an integrator is needed to finish the system. The weighfeeders serves the need to deliver a precise mass flow rate of material. For most applications, the adjustable mechanical shear component profiles the material, and then makes the necessary bed depth corrections for a specific particle size. Altering the speed of the belt maintains the feed rate, but in some instances, the belt speed remains constant with any rate control, which generally happens with a pre-feeding device. These Milltronics weighfeeders are divided int three components namely integration and control, speed and weight sensing, and the conveying system.